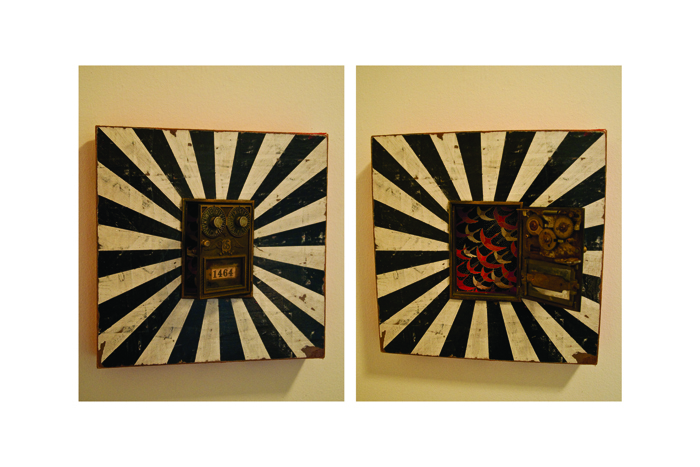 In July I stumbled upon a mixed media piece at the Westport Fine Arts Festival. The artist (who’s card I have fretfully lost, and therefore name I cannot remember, please comment if you know!) discovered some college dorm mailboxes, complete with alpha-combination locks. He transformed them into wooden boxes, perfectly sized for letters and tiny treasures. I couldn’t resist the Alice In Wonderland appeal. And a mailbox–I just had to have it! The art went up on the wall and has since doubled as a mailbox for love letters. Adam and I take turns leaving each other notes and the occasional treat. He was skeptic at first–of both the art and the commitment to letter-writing. But he came around (in full disclosure–now it’s his first stop on the apartment tour). If the mailbox is closed + locked, you’ve got mail! When its open, lovely origami cranes beam back at you. Nothing warms the heart like a love letter. Do you send your lover letters?